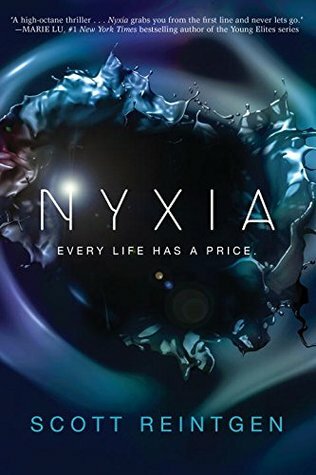 Nyxia by Scott Reintgen is a fascinating deep-space exploration novel. It delves deep into corporate like greed and corruption at its worst. I felt sorry for the band of teens willing to sacrifice everything to win what they and their families need. But there’s more than what the company is telling and showing the teens. It’s deeper and more sinister than they thought. Risks, fear, corruption, and lies are at the center forefront of this book. One boy who has just as much to lose understands more than the others. He realizes what is happening. It’s a deadly game and the risks just got more dangerous for each one of them. That is if they survive long enough to know. Nyxia is a captivating read. The characters are unique. Their personalities added to the plotline. It all made this a fast read. The tale has a way of educating teens of the realities of how bad the world can be. How far are they willing to go just to fix their lives? That question remained and still held in place even after the last page. I am now left wondering what the next adventure in this series will be like. Overall, Scott Reintgen created a book I could not stop reading. Science fiction thrillers usually are not my type but this was definitely worth reading.